As a businesswoman, singer, model, fashion designer, musician and mother-of-two, Myleene Klass has a lot of strings to her bow. So it comes as no surprise that the fruits of her labour include a palatial home to be proud of. 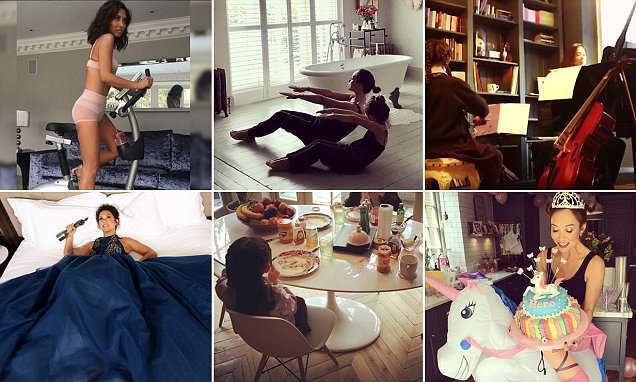 Myleene, 40, often shares glimpses of her family home - which she shares with daughters Ava, 10, and Hero, seven - on Instagram, offering a sneak peek of the on-trend interiors. This week she left fans exclaiming over her enormous, sunny bathroom with French-inspired vintage look mirrors, a stylish cast-iron radiator, a free-standing tub and a dazzling chandelier, when she shared a snap of her enjoying a morning stretch with one of her girls. It comes after the star posted other glimpses of her stunning home, from a music room in which the trained pianist practices with her daughters, to a chic bar cart in the living area and an enormous master bed. Myleene is worth a reported £11 million, and has invested some of her hard-earned money in a luxury London eight-bedroom house, according to The Sun. The swanky pad has featured prominently on the star's Instagram feed, where her fans can see snippets of the period features, modern interiors and stylish furniture. Myleene's bathroom alone features several key interior trends - including the cast iron radiator painted in a chic dark grey. Similar models from the Old Radiator Company cost upwards of £500, while a cast-iron free-standing bath in the style Myleene's from Victorian Plumbing is around £700. In her living room she has a contemporary blue crushed velvet sofa, which she previously posed in front of for an impromptu work out on an exercise bike in her underwear and a pair of stiletto sandals.